Today I went to the Navajo Arts and Culture festival at the Museum of Northern Arizona, which is just around the corner from my house. I did a quick tour. There were some interesting paintings, but it was mostly weaving and jewelry which were not too interesting to me. The museum does have a nice exhibit about the Therizinosaur, a new species of dinosaur that they discovered in Arizona recently. After that I drove down to check out Sedona, which is about 50 minutes south of Flagstaff. The road takes you through some gorgeous scenery including Oak Creek Canyon and Slide Rock State Park. I walked around the touristy streets and shops in Sedona a bit, and had a nice long lunch with phone calls to my parents and Thorp. 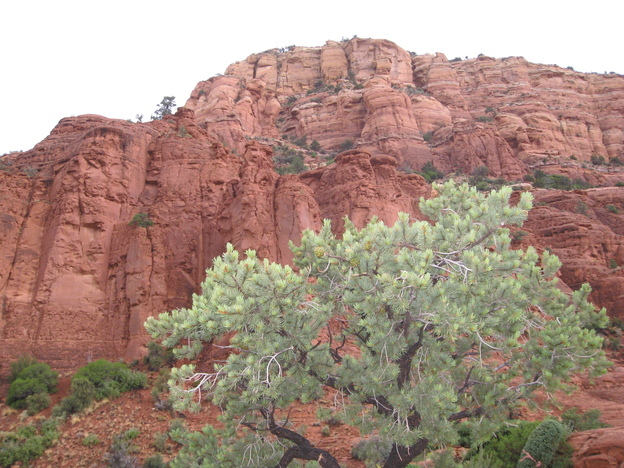 I waited out a thunderstorm, then checked out a few of the nearby lookout points with views of the red rock formations.